"He was the very first to tell it like it was." Few broadcasters have enjoyed the popularity and success that the late Harry Caray experienced over the course of a remarkable 55 years in sports broadcasting. Born in St. Louis, Caray began his broadcasting career at the age of 19, working at radio stations in Joliet, Illinois and Kalamazoo, Michigan. He later returned to St. Louis to begin his major league broadcasting career with the St. Louis Cardinals. Caray soon became the colorful, often controversial spokesman for the Cardinal fan, broadcasting to several generations of St. Louis baseball enthusiasts. It was in St. Louis where Caray first gained national recognition, making fans across the nation with his ability to capture the heart of baseball--and his inability to sing. Caray's unique rendition of "Take Me Out to the Ballgame" has become a favorite with baseball fans across the United States, though his voice has been compared to a "buzz saw" and is said to "sound like he got hit in the throat with a shovel and never recovered". 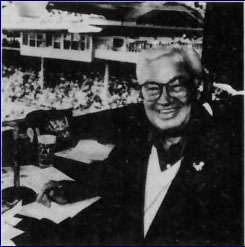 Caray spent the 1970 season broadcasting Oakland Athletic games on both radio and television. In 1971, he moved to Chicago where he became the radio television voice of the Chicago White Sox. Eleven years later, in 1982, the Chicago Cubs welcomed Caray to Wrigley Field where he continues to broadcast Cubs games on WGN-TV and WGN Radio. Harry Caray passed away February 18th, 1998 after suffering a heart attack four days earlier.